Here is the first page of Asher Benjamin's pattern book, printed in Greenfield, Massachusetts in 1797. I show here that page and Plates 25 and 26 from my copy of the 1992 reprint by Applewood Books, Bedford, MA. The original prints of The Country Builder's Assistant which I've read (available in rare book libraries) are full of smudges and notes made by their owners. Clearly the books were well used. 200 years old: they feel ready to be used again. They are quite small, about 5" x 8, so I think the engravings were intended as concepts. 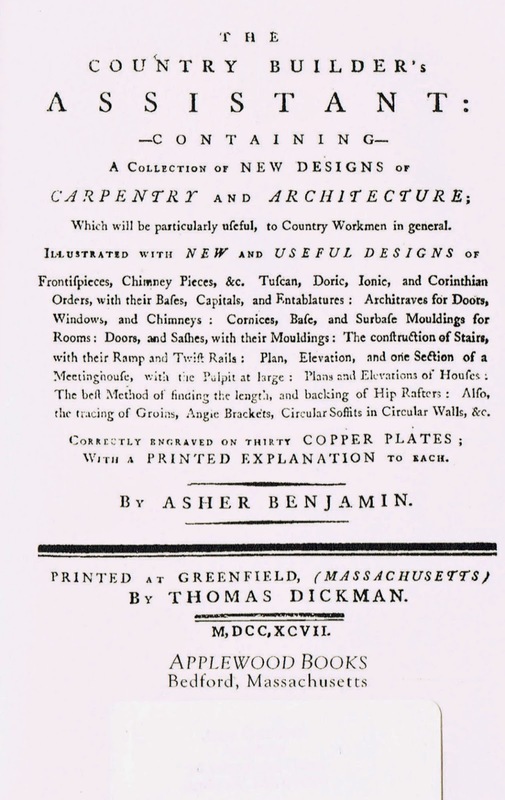 Benjamin says, just above his name on the first page, "with a PRINTED EXPLANATION to each". But there is none for these plans and elevations. Did he expect that those using his book would need no more explanation to adapt these drawings to their own use? That they, having served apprenticeships with master-builders and joiners, could read the geometry? It has been suggested that these and the church design were after thoughts, dropped in. Perhaps. However in the sequence of the book they come in logical order: after stairs and before roofs. These are a way to present ideas, not fully realized designs. He draws them causally: no sash in the windows, no framing notations, just a sketch. Did he use geometry? Yes. uses the same geometry for plan and elevation - 2 squares crossed. The width of the hall is determined, 8 1/2 units, the length set: 26 units. Starting from the left and right walls of the hall, one square goes to the right - red solid lines - the other to the left - red dashed lines. The left front room is square, the back room the left-over space. The right front room - the kitchen with its circular baking oven - is deeper, its size and those of the rear rooms laid out by smaller and smaller squares - see the red dots where the lines cross. I have drawn the diagonals of the half squares for fun because they locate the columns dividing the front hall from the stair hall. -dashed green lines. The elevation uses the same geometry, crossed squares. I drew them from the base. The space where they cross is the width of the dramatic entrance. If I had started them at the line of the first floor, where the granite blocks give way to clapboard, the squares would have outlined the Palladian window above. 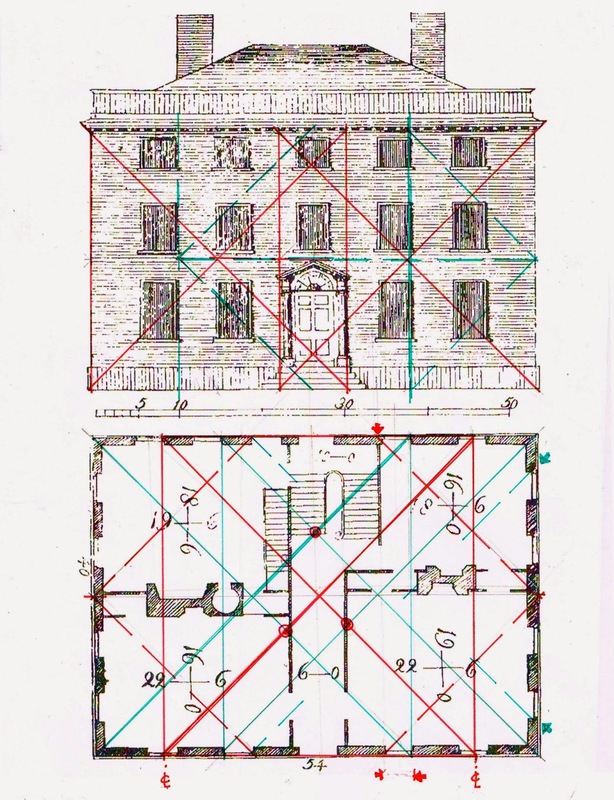 On the right the windows are located on the half and quarter marks of the square - red verticals. 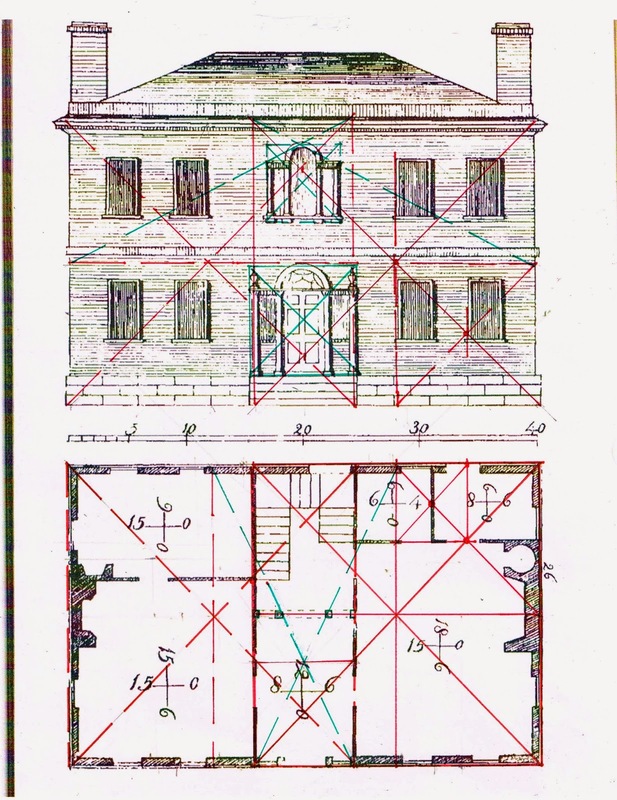 The diagonals of the half squares touch the tips of both sides of the Palladian window. I have marked them in green as well as the squares around the entrance and the window. A 3 story Federal house - with its characteristic smaller third floor windows, a balustrade to hide the roof, and a entrance with columns and a fanlight. There are 2 possible geometries here: 2 crossed squares - shown in red on the elevation - lining up neatly on each side of the entrance - or a square on end in the center - half shown in dashed green, left of center. The focus on the center would be a tentative nod to Palladio. The windows are set by the center lines - green verticals. In plan the same choices exist, crossed squares - in green - or a square in the center overlapping a square of the same size on end (en pointe?) - in red. Its sides extend beyond the drawing. The centered square locates the center lines of the windows, the stair hall wall. The crossed squares overlaid on the centered squares locate the head of the stair and the width of the hall - red circles. There is more... see the green arrows which show a smaller square within the larger, determining the location of the side windows. I think Asher Benjamin was having fun: no client to please, no budget, only himself; a quick and neat presentation of ideas on a very small scale where precision didn't matter. I also think his audience could read 'geometry'. It was not a foreign language.